This trendy, innovative protective sleeve utilizes the latest consumer technology to safeguard your Ipad from any unwanted bumps, scrapes and knocks which may result in damage to your device. Premium quality plastic steel zipper enjoys premium quality and extends its service life. Extra protective sheet above the size pocket zipper intends to prevent the sleeve and the accessories inside from being water spilling. The innovatively designed back handle allows you to easily carry and transport it anywhere you go. 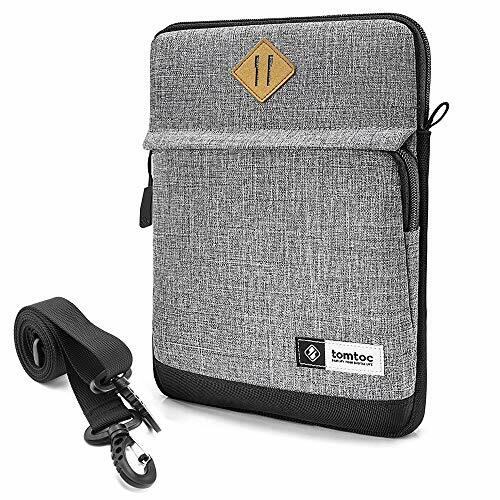 Being slim and lightweight, this tomtoc laptop sleeve can also be easily transported inside other bags. Well-armed with CornerArmor in the bottom and 360° protective ridge around the interior protect your laptop in any accident like the AIRBAG in the car. Premium quality polyester and the micro fiber badge make this sleeve elegant and durable. Specially designed for 10.5 inch iPad Pro 2017 | New iPad 2017 | 9.7 inch iPad Pro, is also compatible for other 9.7 and 10.1 inch tablets. US & Foreign Patent applied: CornerArmor armed in the bottom protect your laptop in accident just like Car Airbag.